No matter the scale of an object, whether it is a small, hand-held device or a tall building, we ask of it to more or less “act” human. This is the familiar conceit underlying MoMA’s Talk To Me, an exhibition showcasing technologies “that enhance communicative possibilities and embody a new balance between technology and people, bringing technological breakthroughs up or down to a comfortable, understandable human scale.” This act of asking, of needing technological objects to be more like people takes different aspects, is based around notions of reflexivity; That is, of acting, reacting, responding to our own impulses in a like manner. Things do not “talk.” They may communicate, send us messages, data, or other kinds of information, but only at our own behest, on our own terms. We identify and design the contours and parameters that allows technology to communicate with us. We imbue the objects we design with a kind of communicative ability that has nothing to do with physiology or language, but that has everything to do with prescribed routines and tasks. If things indeed do “talk,” this is only because we “tell” them to. One wonders, then, if a technological object’s own verisimilitude to humans—whether it can “talk,” “see,” and otherwise sense the world like us—becomes the sine qua non of good contemporary design. One also wonders if this desire is actually a burden. If so, who or what shoulders the weight of this seemingly impossible task? Friedrich Nietzsche once wrote of an unburdened modernity that would “kill the Spirit of Heaviness.” This unburdening is more than philosophical; It describes the actual, physical unshackling of bonds of gravity. No endeavor has captured the sense of philosophical and physical unburdening like human flight. From Icarian waxwings to Otto Lilienthal’s hang gliders (and, to a certain extent, even Yves Rossy’s jetsuits), a quick inventory of the history of manned flight amounts to no less than a study of how tinkerers and scientists persisted in modeling human flight on bird flight even into the early 20th century. And with the advent of modern rocketry, of conceiving and executing the machines that finally allowed humans to escape gravity’s burdensome maw and spring into the weightlessness of space, the Icarian folly was abandoned in favor of technologies that looked more “human” than ever before. The literal “human” in “human flight” is the subject of a post at Ptak Science Books that calls attention to the visual similarities between two images of flying humans. 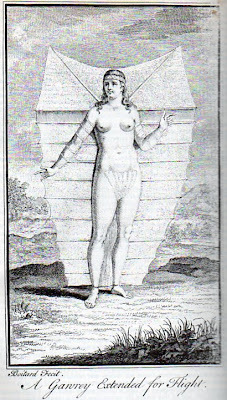 The first is an engraving by Louis Peter Boitard from Robert Paltock's The Life and Adventures of Peter Wilkins, a Cornish Man, Relating Particularly, His Shipwreck near the South Pole; his Wonderful Passage thro a Subterraneous Cavern into a kind of New World, his there Meeting with a Gawry or Flying Woman (1750). It features a scantily-clad female figure, anything but demure, with a kite-like device harnessed to her back. 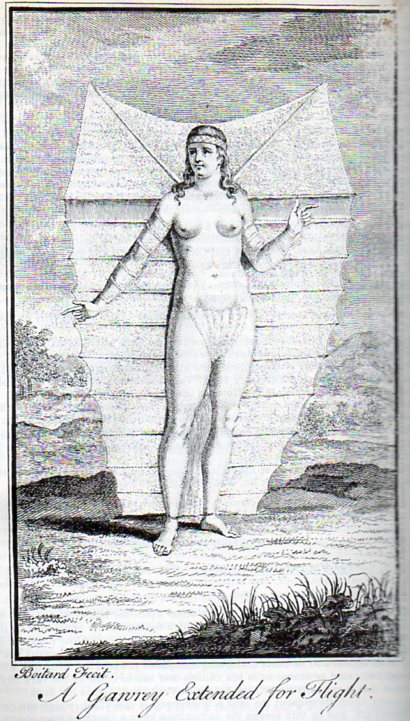 Boitard’s engraving only alludes to flight, as our posed, Icarian Gawry stands with one hand pointing up, the other down, alluding to her role as a person mediating between earth and sky, yet all-too-rooted to terra firma. The technology depicted here is more accessory than airworthy. It appears a bit too small to support the Gawry’s frame. However, a closer look at Paltock’s text reveals something much more interesting. The kite-like device is literally clothing. 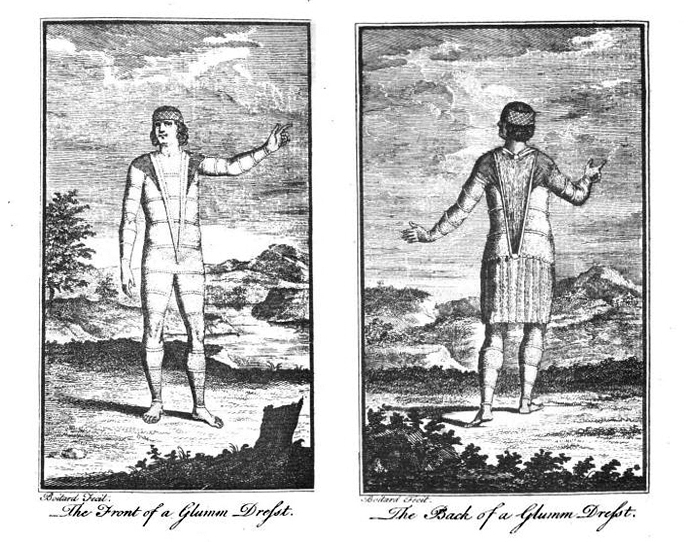 A Gawry or Glumm (her male counterpart) wears a suit which, as depicted in Boitard’s other engravings, appear as a form-fitting leotard-like garment that extends to its kite form when arms and legs are outspread. 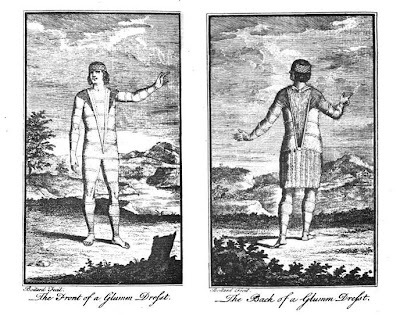 Paltock even describes how, in a moment of curious gender-bending, the Glumm’s garment is comprised of stiff membranes and whalebone ribs—in other words, a corset. As objects of wonder, Gawries and Glumms levitate effortlessly in the pages of The Life and Adventures of Peter Wilkins, carrying cannons and even a seated figure into the skies. Yet this is an effortlessness made possible by technology that is unlike the ungainly or clunky artificial wings drawn by Leonardo da Vinci and others. This is, after all, clothing whose ability to follow closely the contours of the human body provides the appropriate shapes and cambers to form the kite-like extension. 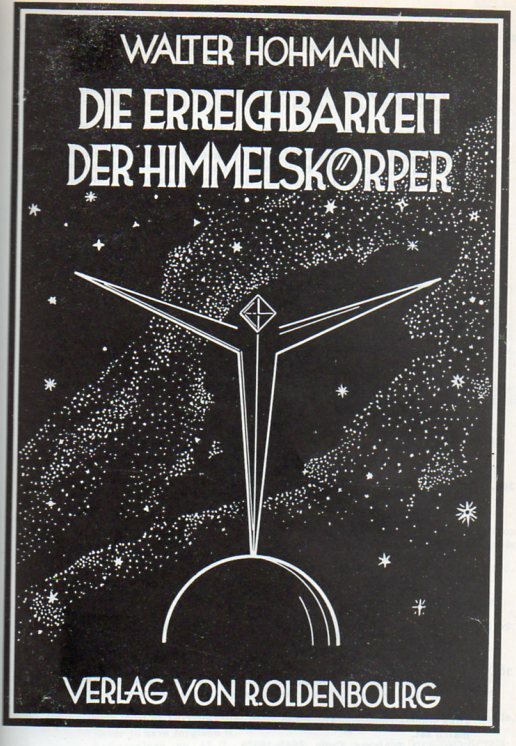 The second image, the frontispiece to German scientist Walter Hohmann’s treatise on spaceflight, Die Erreichbarkeit der Himmelskörper (The Attainability of Heavenly Bodies) (1925), shows flight in its most reductive (and anthropomorphic) manifestation. It is a depiction of an unclothed, idealized human figure, balancing precariously on the curved surface of a planet (presumably Earth), arms outspread like wings as if about to leap into the Milky Way’s starry belt. The image at once suggests liberation, and indeed Hohmann devotes much of his text to the physics of escaping Earth’s gravity. 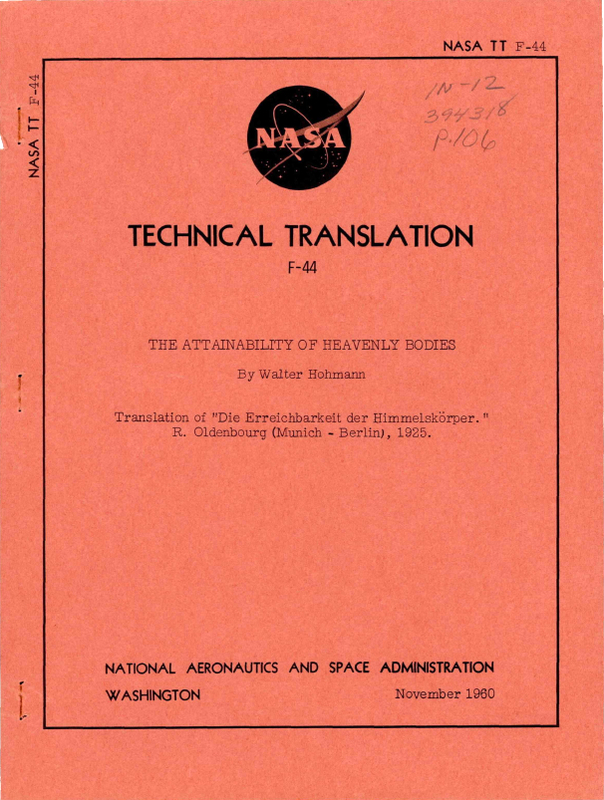 He bases his theoretical calculations on previous work on rocketry, most notably Robert H. Goddard’s influential A Method of Reaching Extreme Altitudes (1919) and Max Valier’s Der Vostoß in dem Weltraum (The Advance into Space) (1924)—texts that relied on “exhaust-gas velocity” as a means for propulsion. 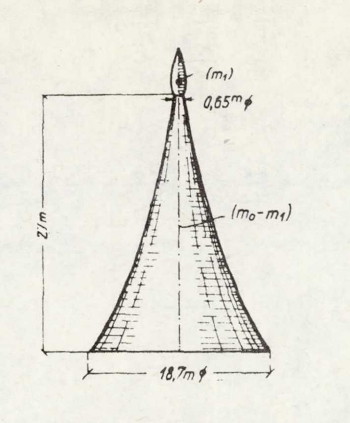 Hohmann’s preferred mode of space travel is a small, teardrop-shaped projectile that sits atop a giant, explosive-filled rocket. 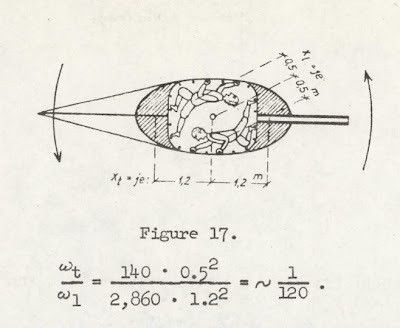 And though the question of propulsion remained for Hohmann “a question for the technology of explosives,” his evocation of this model of spaceflight has some important antecedents. The most important of these is Herman Oberth’s Die Rakete zu den Planetenräumen (The Rocket into Interspace) (1923), a work that was not only influenced by Jules Verne’s Autour de la Lune (Voyage Around the Moon) (1872), but that also qualified Oberth for his first “assignment” as scientific consultant for Fritz Lang’s Die Frau im Mond (The Woman in the Moon) (1929). All of these feature bullet-shaped projectiles that jettisoned additional stages in order to accelerate through space. 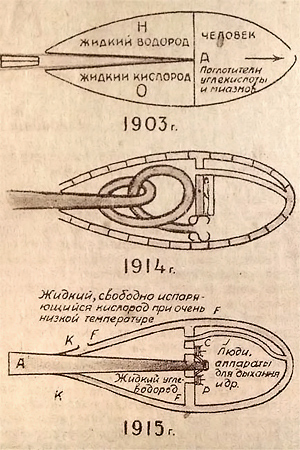 (Top) Walter Hohmann, Drawing of Spacecraft, Elevation (Source: Hohmann, The Attainability of Heavenly Bodies, 11); (Bottom) Konstantin Tsiolkovsky (1857-1935) (Source: Andrei Nakov, "Quelques éléments d’une convergence significative entre Malewicz et Ciolkovski," in La conquête de l’air : Une aventure dans l’art du XXème siècle [Toulouse: Les Abattoirs, 2002]). 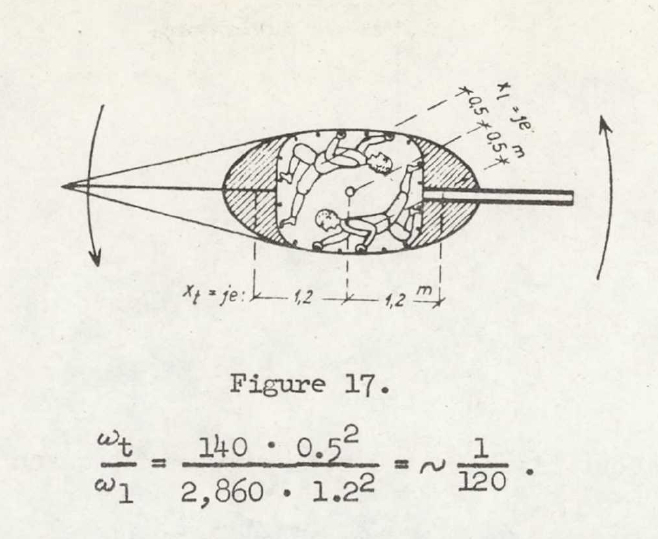 Hohmann’s spacecraft is smaller, more compact, with only enough room for two passengers. It references projectile designs by Russian rocketry pioneer Konstantin Tsiolkovsky, whose spacecraft and rocket engine designs featured ovoid, aerodynamic shapes to lessen friction during ascent and descent. Work by students at Moscow’s Higher Art and Technical Studios, or VkhUTEIN would demonstrate a passing familairity with Tsiolkovsky’s work. Examples include Georgy Krutikov’s “Habitation Cell” (1928) and Iosevitch’s study for a Congressional Palace (1929), both deploying teardrop-like aerodynamic shapes at the vehicular and architectural scale to represent speed and progress. 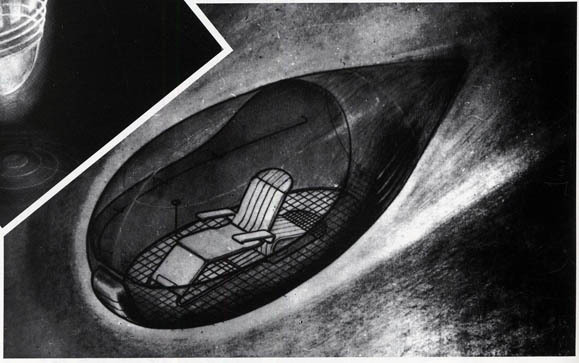 Yet Hohmann’s vehicle, with its hyperboloid rocket stage, references Tsiolkovsky in another, more curious way. 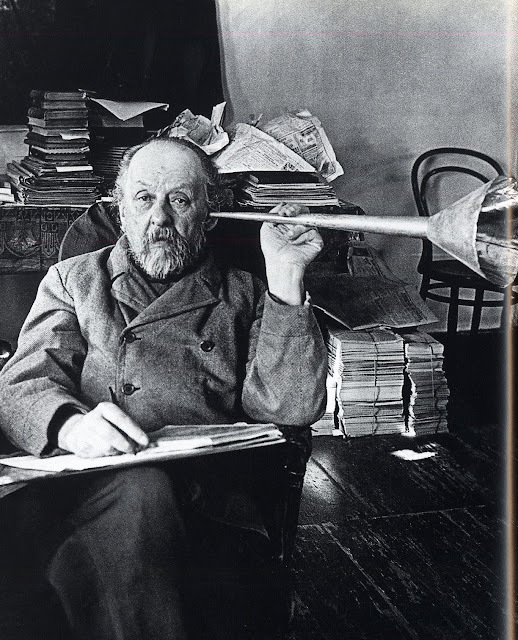 The hyperboloid shape resembles an ear trumpet, and indeed, one of the most famous images of Tsiolkovsky shows him holding such a device to his ear. This image of Tsiolkovsky reinforces one of the central points of this post: A technology designed for escaping Earth’s atmosphere now becomes a device to help a person communicate. To borrow an argument made by the late Denis Cosgrove and William L. Fox, the hyperboloid rocket is prosthetic and aesthetic: it extends the capacity of the ear while reinforcing the spacecraft’s familiar form across different media. Yet more needs to be said about the process of spaceflight and how it translates into a kind of communication. The idea of a rocket as a prosthetic, aesthetic, and finally, communicative device reaches a strange apotheosis in the last moments of Thomas Pynchon’s Gravity’s Rainbow (1973)—a description of a V2 rocket variant called Schwarzgerät, or Rocket 0000, taking off to an unnamed target. Aboard Rocket 00000 sits Gottfried, trained and conditioned to act as the rocket’s internal guidance system. “Guidance” is a misleading term, however, as our pilot/astronaut wears a form-fitting shroud made out of a mysterious plastic called Imipolex-G. Its purpose is to translate a human’s sensory inputs into polar coordinates. Gottfried has no means to actually talk to those on earth, much less the Schwarzgerät itself. There is no calculation, no communication, only pure reaction. Museum of Modern Art, Talk to Me, http://www.moma.org/interactives/exhibitions/2011/talktome/ (accessed 8 September 2011). Here, the legal maxim res ipsa loquitur (“The thing speaks for itself”) will likely be invoked. Without going into a jurisdiction-by-jurisdiction account of its use, let me state that notable exceptions notwithstanding, the doctrine applies only in cases of negligence. Res ipsa loquitur can be used in the absence of direct evidence of negligent behavior, the major qualification being that the thing that “speaks for itself” only does so because it was under a person’s control. This is but one instance of how our desire for objects to be “human” may be quixotic. To say that technology should be “understandable” and “comfortable” is a way of restating something which is fairly clear: We want our technologies to be more and more like us. Friedrich Nietzsche, “Of Reading and Writing,” in Thus Spoke Zarathustra, R.J, Hollingdale, trans. (New York: Penguin, 2003 ), 68. 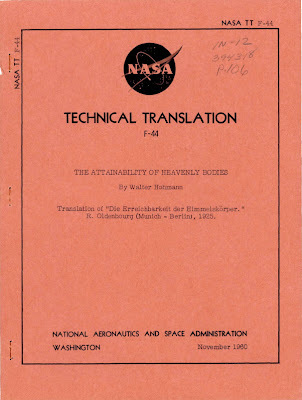 Walter Hohmann, The Attainability of Heavenly Bodies, Technical Translation F-44, U.S. Joint Publications Service, trans. (Washington, DC: National Aeronautics and Space Administration, 1960), 11. 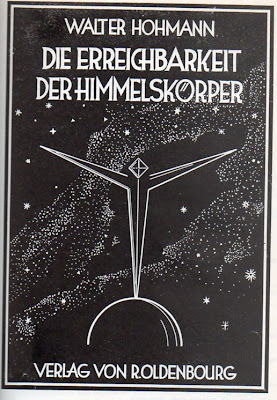 This is the official translation of Hohmann, Die Erreichbarkeit der Himmelskörper (Berlin and Munich: R. Oldenbourg, 1925). Cosgrove and Fox use this argument to describe the tools and processes of aerial photography. In their words, “Photography’s purpose is at once prosthetic and aesthetic (in the broadest sense of the word): to extend the capacity of the human eye to perceive the world, and to capture and freeze a moment in space and time, documenting and archiving it, and rendering it mobile through the printed and transmitted image.” Denis Cosgrove and William F. Fox, Photography and Flight (London: Reaktion Books, 2010), 8.